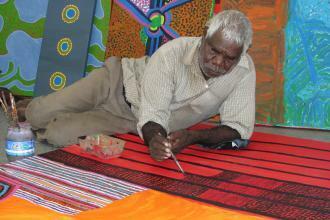 Mangkaja is a community of artists who share land, history and culture. The diversity of artists' backgrounds, between the river and the desert, upbringings and ages is evident in the work with a mix imagery drawn from traditional, town and station life. 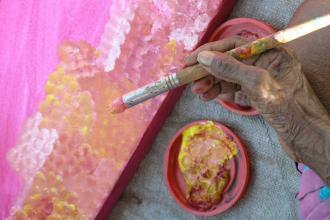 In some art works the different influences are clearly separate, whereas in others they merge as one. The artists enjoy a freedom from the conventions that are often associated with Aboriginal painting and they employ a full palette with vibrant results. Some of the artists have been painting for more than thirty years initially as part of their adult literacy classes at Karrayili Adult Education Centre (established in 1982), and later at Mangkaja Arts. They have worked together in groups at Karrayili and Mangkaja. Despite this communal approach, the artists have retained highly personalised styles of working and ironically, it is this diversity which in part gives cohesion to their group exhibitions and the large collaborative works that they produce. They have exhibited nationally and internationally, with an exhibitions program that seeks to maintain a balance between group and solo shows. The art centre has produced a number of important artists recognized for their contribution to the modern phase of Australian Aboriginal art including Wakartu Cory Surprise (1929-2011), Janangoo Butcher Cherel (1920-2009), Paji Honeychild Yankarr (c.1912-2004), Boxer Yankarr (1930-1995), Nyirlpirr Ngalyaku Spider Snell, Ngarralja Tommy May, Janyka Ivy Nixon (1935-2004), Mawukura Jimmy Nerrimah, Jikila Nada Rawlins and Sonia Kurarra. The renowned artists Kuntika Jimmy Pike (c. 1940-2002) and Jarinyanu David Downs (c. 1925-1995) also enjoyed long associations with the art centre. Please view the artist’s biographies and gallery of artworks, which provide an overview of each artist’s achievements and main painting stories.